Today's theme for Muffin Tin Monday is 'Movies'. Well, I guess you could take that a couple of ways. But I decided to pick a movie. Technically, we like the book better than the movie, but we also have the old cartoon and modern remake of this classic. So we had slop trough celery (with pb, raisins, and peaches), Annie's bunny mac+cheese, Wilbur the hard boiled egg (first time using my food writer markers), pig in the corn, sliced grapes, and Charlotte (spider non-edible) in her web on a graham cracker. This went over very well, although there was some conflict over Wilbur. Pierce said, "I want to eat my egg, but I don't want to eat WILBUR!" Then he asked me to make him a spare - so he'd have one to play with and one to eat. I finally did manage to talk him into eating Wilbur (and without creating a spare). Is it just me, or does Wilbur look exactly like a weeble wobble? Want to join in on MTM? I love it. Wilbur is cute! Cute!! Yes, Wilbur does look like a weeble wobble! That is a great tin! Love the theme. I love the spider web, the slop, and all the little pigs. What a great movie to pick. This is SOOOOO Cute!! We love Charlotte's Web over here too -- I'm going to have to use some of your ideas. You're old enough to remember Weeble's????? "Weeble's wobble but they don't fall down!" Awww job! 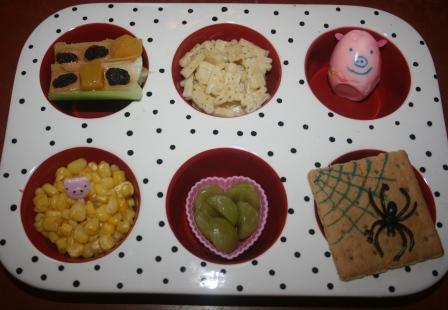 Loving the spider and web on the graham cracker, and the piggy egg is super cute! This is just ADORABLE!!! My girls have recently started watching Charlotte's Web. I am so excited, I love this movie too!!! I jsut realized I have been so busy that I am something like 4 or 5 blogs of yours behind. This is SO NOT like me! I promise to try & catch up soon.